David Hinckley the media columnist at the New York Daily News yesterday penned an article "Comedian D.L. Hughley comes up huge on his 1st week as Kiss-FM Host." I thought in some way the article would reveal that Hughley had catapulted ahead of Steve Harvey in the competitive New York ratings race for number one morning show among African American listeners. That would be amazing after one week. So lets look for the proof that Hughley comes up Huge! Here's a portion of the article "D.L. 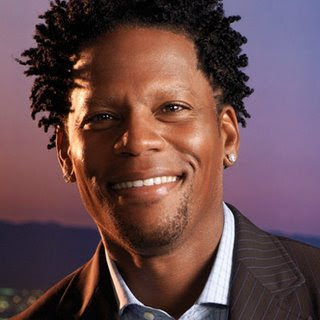 Hughley spent some of his first week at WRKS (98.7 Kiss FM) getting his radio sea legs. But he generally sounded comfortable at the mic as he took over the Kiss-FM morning show, and he brought along some extended thoughts and a steady blast of one-liners. The article is simply a promotional piece for readers of the Daily News to tune into the new morning show over at 98.7 Kiss FM. Hughley's brand of morning radio shtick definitely struck a chord of inspiration and enjoyment to Mr. Hinckley. The article promotes a new morning show in a way I have not quite ever seen before, especially for an urban radio station. Hinckley writes; "But his rapid-fire style - a big contrast to his colleague and rival Steve Harvey over at WBLS (107.5 FM) - put his stamp on the show." Sounds a little bias to me. I gather Hinckley is not big fan of Steve Harvey. Steve, did you piss somebody else off? - "I am totally disgusted with KISS FM after being a loyal listener for too many years to count!!! Please bring Jeff Foxx back, the powers that be at the radio station should know that DL Hugley is a big mistake! Learn from past errors! Jeff FOxx was real and could relate to the average person who is the one that supports the radio stations. I will be listening to Ed Lover now because I cant take Steve Harvey and I am 41 years old! (see other comments at this link>) July 27, 2009 4:12 PM"
Well that's an interesting comment. A radio listener that is 41 years old would rather listen to Power 105.1, a hip-hop station geared towards 18-34, rather than the 25-54 age stations WBLS and WRKS. Why? I say because Ed Lover is local and not syndicated. No matter that Hughley is only on 98.7 Kiss FM for the moment, his voice is piped in from Los Angeles. Listeners know he's not in New York. Besides it's what the listeners think and choose to tune into and not a columnist at the Daily News, that counts. This is why blogs can be dangerious and very misleading, you mislead the daily news columist comments totally and give inaccurate information as well, Hughley to ur suprise I'm sure, is not being piped in via ISDN from LA, he is live in the studio of kiss fm, Hinckley has also promoted steve harveys radio show, and when wlib decided to have us praise the lord instead of talking about issues effecting nyc's black community, and when Air America became wlib and the largest carribean population outside of the carribean was left without programming, to inner city broadcasting David Hinckley is a god send why? because he gives them press that no 1 else will nor care to, even when they fool their listener to stay afloat as a business, the days of there being a morning show battle for the african american radio listener in nyc was two decades ago, the black population of nyc is more non native born now, radio that serves the black listener in nyc has become marginalized, and will continue to be so. Why? the black population of nyc is lowering, and it also has become fed up with wackness passing itself off as "Urban" entertainment. And have turned to other ave's like pirate radio, shocking huh? but there is a reason why, it's called not being served! You can champion inner city broadcasting and Emmis Broadcasting etc who feels if they give wack radio they can continue to stay in business, frankie crocker and dorothy brunson are not walking through the door to save wbls again those days are gone, nor is Barry Mayo walking into kiss fm, the black population of nyc tolerates steve harvey, because they know that is what peppy sutton will tell them it's good for them and what's good for his bottom dollar line, same as emmis broadcasting jeff smulyan. What really surprises me you would post somthing so inaccurate, i doubt hughley will be syndicated, I think black people nation wide have finally, but unfortunately after almost decade have had enough, do you remember when steve harvey was thought to be local when he first came to nyc? even though clear channel approached wbls about housing his show from their studious to be nation wide? from the begining. Subscribe to the daily news so you dont get things twisted. And now for an ACCURATE assessment of that train wreck that they refer to as the DL Hughley Morning Show. Unfunny, unfocused, unreal, unprofessional...and very, very crowded. I like David. I like him enough to respect the fact that he is entitled to his opinion. He thinks it's great...and I feel the complete opposite. The show is eligible for syndication...and I KNOW this because I actually applied for the job. Although DL isn't broadcasting from LA....eventually, he will. Trust me. The DL Hughley Show....just another reason why radio is dying a slow and painful death. I'm going to try and get a job as a comedian. Let's see what happens. I'll keep you guys updated. And to the owner of this blog....keep on doin' yo thang. Love your perspective on the industry. The addition of DL Hughley is the last straw. After attempting to listen to his new morning show on KISS, I have decided to plug in my iPod in my car and listen to my chosen songs in the morning. DL is awful...he is overbearing and doesn't know when to shut up! Poor Bob Slade can't even get the news out with DL talking over him or interrupting. It's awful at KISS. DL Hughley is the worst. KISS fm should be ashamed for calling themselves the "Grown Folks Station" and subjecting the listeners to this immature, unfunny, self-centered, sexist moron. He talks over and interrupts everyone's segments. And his sorry "constipated lover" nick-name he gave Bob is not/ and never was funny. It's gotten tiresome. DL is so immature, the only reason he keeps up with calling Bob "the constipated lover" is because he KNOWS Bob doesn't like it. So in DL's childish mind, this is hilarious. I have been listening to KISS since I won KISS'ing at work in 1993. DL wasn't on last week, and he was not on today. I hope you sent him packing and are looking for some REAL talent to lead the Morning Show.